When I purchased F1 2010 I bought it excited to finally be able to play a racing game based firmly in the realities of a real life sport that I love. I was eager to re-live some of the moments that made the real 2010 season so amazing, and ready to drive on both tracks I’m familiar with -- but don’t get featured regularly in other games like Monaco and Albert Park in Australia -- as well as venues completely foreign to me, like Abu Dhabi or Singapore. It was an opportunity to do something different, again, after years of familiarity in games like Forza or Gran Turismo. Never in my life did I expect it to enlighten me to things I was oblivious to previously, or for it to completely change my perception of the genre or, indeed, change me as a player. 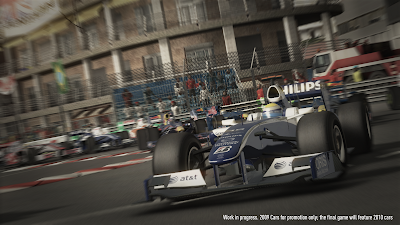 By approaching the game like I have, by living the life (so to speak), F1 2010 opened my eyes to a whole host of things and, now that the series is under way and I’ve demonstrated my commitment to it, I thought it was time to discuss just what they are. One of the first things I realised by playing the game the way I do was that I was telling a story; that I was giving the events that unfolded weight and meaning. Instead of engaging it as a series of tracks and menus like it actually is -- like most racing games are -- I was giving each race, each event, a purpose, and realising that was fascinating. Thinking about it some more, I started to recognise that I wasn’t just telling this story as it happened (what you see here on the blog), I was actually creating it by living it. I wasn’t taking what took place and repurposing it to post a story afterwards, I was going through the events as they occurred, reacting to and dealing with them as if they really happened and that amazed me. It wasn’t a case of a spin just happening and me forgetting about it by the next corner as in other games, that spin was important because it was a mistake on my behalf, affected my current round’s progress directly and impacted on my overall impression of my performance(s) for that event. Basically, I was thinking like a driver rather than a player and as a result, acting like one too. In any other game, this would be considered role playing: I’m intentionally playing in a particular way to benefit my desired experience, and to fulfill an activity that, as much as I’d like to, I can’t do (professionally, at least) in real life. Videogames have an entire genre centered on this act, on our assumption of doing something we can’t or won’t do in our real lives, but no one would ever expect a racing game to be an RPG -- even games like Test Drive Unlimited 2 wouldn’t be considered as an RPG, despite its leveling up and general lifestyle (more on this soon) -- and I certainly never expected an F1 game, of all things, to deliver such an experience. In some respects, it doesn’t -- my approach is what makes this story, this particular role, possible, not the game itself -- but the fact that, by living it myself, I’ve shown it can be done is significant, I think, and opens up a lot of possibilities for the future. In real life, racing can be hard to get into, requiring a lot of money to survive and, it has to be said, luck too -- I myself missed out because it wasn’t financially viable despite some unexpected support, so it’s not easy. * If racing games could enable people to fulfill their dreams as a racing driver in a virtual (and therefore, much cheaper) environment, then that could open up a lot of opportunities, not least of which is allowing people to live their ideal lives. At the end of the day F1 2010 may just be a series of menus and circuits like all other racing games, and I may just be pressing buttons on a controller, but if games in other genres can empower us to do things that are impossible in reality or take us to places we are unable to physically visit, then surely racing games can too? I’ll have more on what playing F1 2010 in this way has revealed once the season is a little further along, so stay tuned. *Yes, my love for racing could have become a professional reality if I had the means (read: money) to make it happen. I didn’t, however, so virtual racing -- among other things -- satisfies a void that my real life circumstances could not. It is great that you are enjoying your gaming on a whole new level. I guess me for role playing is something that does not really excite me because I don't want to become to invested into games because I have had problems with addiction while playing MMOs. I am not trying to put you down with my sad experinces but I am glad you are having so much fun. The only thing I would like to ask is do you hope to take your love for F1 to the next level in terms of gaming? Have you found any groups that compete against each other locally or online? Gaming in Public -- No I haven't pursued competitive racing or anything like that, and I haven't played the game online at all despite my friends wanting to prior to the game's release. I've been too busy focused on this story and approaching it the way I have which, quite frankly, has been too damn enjoyable to think about doing anything else, like playing the game as most others would. I'm not sure I'd find like-minded individuals anyway so while the idea of forming a full grid of true players is enticing, I don't see it ever happening. I had a bigger comment than this lined up for my response but Blogger decided that it was going to be a pain, so my apologies for that. Also, as always, thanks for the comments. It's appreciated!